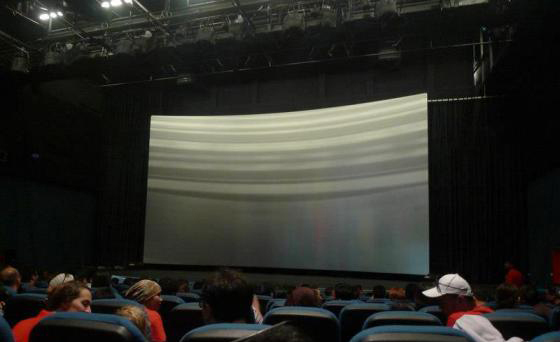 A question about the curved screens used in the King Kong 360 3-D stereoscopic installation at Universal Studios was raised by Rita Santos during class. This lead to a discussion about catenary curves and the history of multiple projector exhibition. 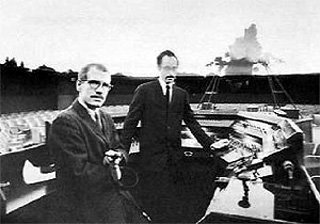 I mentioned a conversation that I had been involved in with Peter Anderson after Serge Bromberg’s 3D Rareties presentation at the Linwood Dunn Theater in 2010. During that discussion Peter described an installation he had created where he employed gravity sagging in the construction of a curved screen. In response to Rita’s question I surmised that Peter had probably used a catenary curve for the Kong screens. I found a cord in the lab that I used to roughly demonstrate the general properties of the catenary (there is an interactive online catenary generator created in processing with which you can experiment and an excellent paper describing the projects origin) I also spoke about Gaudí’s use of catenary curves in the design and construction of elements of La Sagrada Familia and other structures. The stereoscopic image below is a cross-eye floating window view of an exhibit of Gaudí’s weighted chain catenary curve models at La Sagrada Familia. I shot the images with a pocket camera in cha-cha mode and my horizontal shift was a bit too wide thus creating the extreme horizontal parallax. Later I wrote Peter and asked him about the Kong screens. He replied that what he had been describing was the gravity sagging solution he had applied to the design of a 24 foot high by 36 foot wide screen for the LEGO Racers 4-D installation at LEGOLAND. 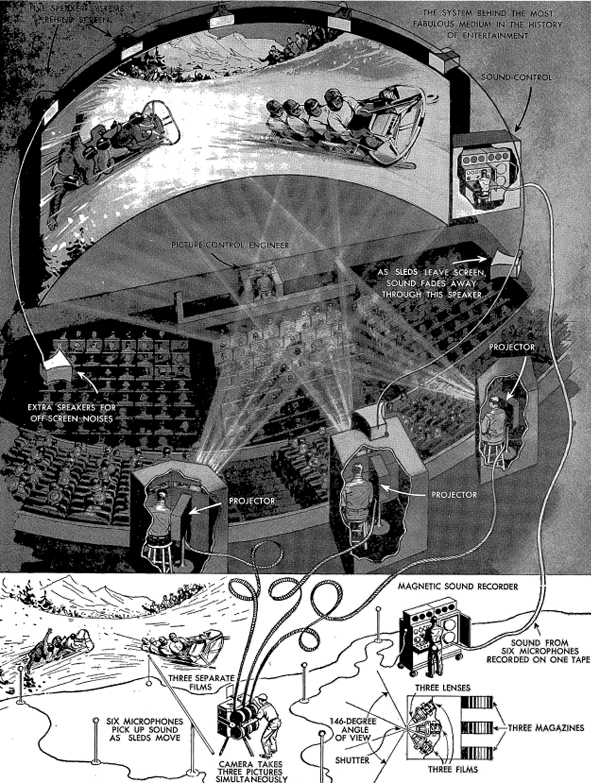 The 187 foot wide by 40 foot high screens for King Kong 360 3-D were actually symmetrical hard surface silver screens based on toroidal sections. The 3-axis compound curves of the screens were designed to optimize light return from the projector positions to the multiple viewpoints of the tram guests while also minimizing screen crosstalk. 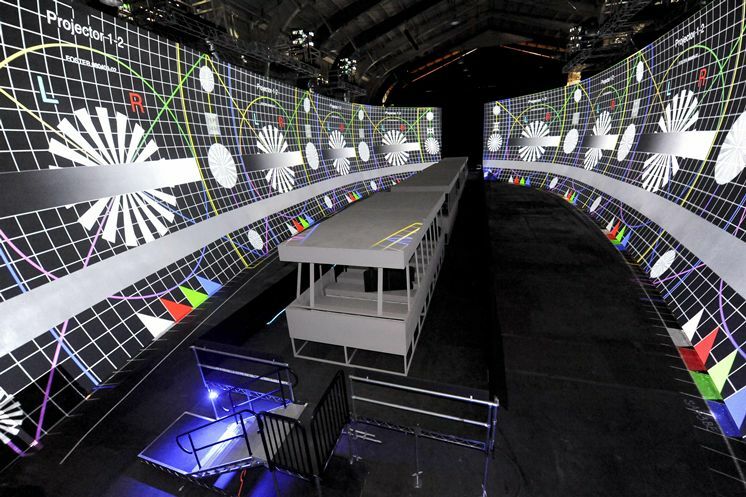 The screens were fabricated by LA ProPoint (coincidentally the company that developed the giant wheel for the CalArts co-production “Prometheus Bound” in 2013 –and ten years earlier, the mechanical components of the REDCAT). Universal Studios created a 20 minute making-of promo for the King Kong 360 3-D experience which is available in four segments on YouTube [ 1 | 2 | 3 | 4 ]. The LEGOLAND project, “LEGO Racers 4D”, was installed into a re-purposed former live show attraction theater that had a very steep seating rake. 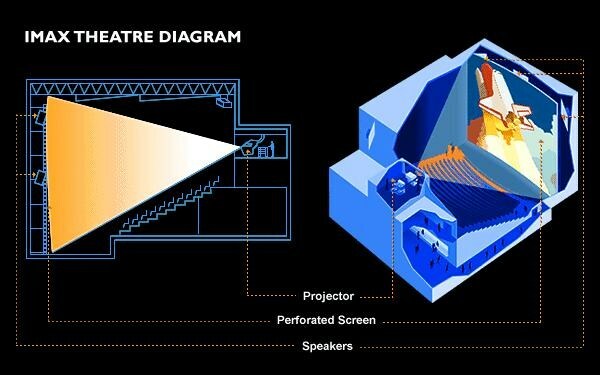 This layout required the dual DLP 3-D projectors be mounted high in the venue. The screen I used was custom a non perforated Stewart vinyl silver (3-D) screen (approximately 22′ x 36′) mounted on a curved (concave) frame that was equal to the chord of the projectors’ throw. I set the vertical angle seven degrees tilted back in order to optimize the projector’s light return to the guest’s seating positions. To additionally increase the sweet spot, I then had the screen’s installers proportionally relax the tension on the top and bottom of the screen’s lacing until I achieved a proper amount of gravity driven screen sag which thus optimized both the high-low and the side-to-side viewing experiences. It was probably only slightly over a one foot additional vertical derivation centered around one third up from the screen’s bottom mount and proportional to the left right center, but this combination of the tilt back and the gravity driven concave vertical sag created around a 50% overall better venue viewing experience. 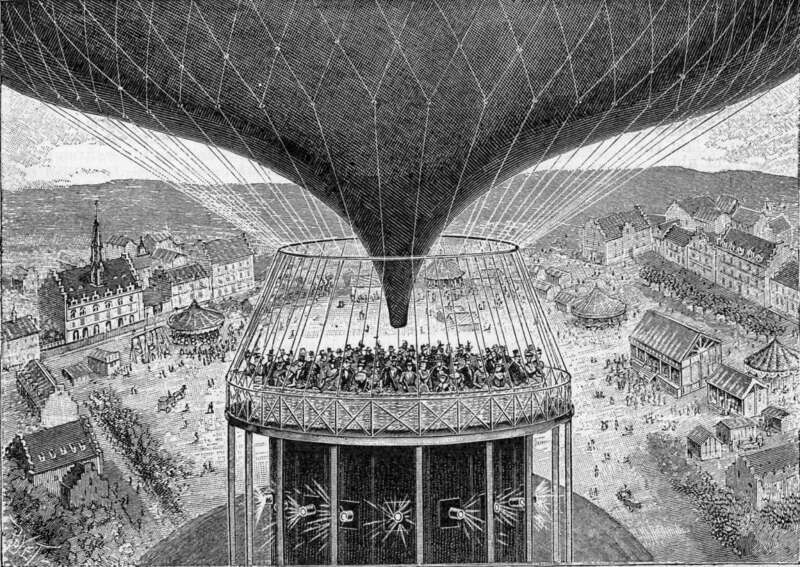 The image below left is from the cover of September 29, 1900 edition of the Scientific American weekly and features a cut-away view of the Mareorama, an attraction at the 1900 Paris Exhibition. The cut-aways show the water bearings that spun long painted scrolls (one for starboard and one for port) that wrapped around a large motion platform in the form of a 230 foot long steamship. Up to 700 spectators stood upon the deck of the rolling and pitching ship as the scrolls slowing wound them along a voyage from Marseille to Yokohama. Blowing fans, lighting effects, steam whistles, motor sounds, scents, and actors serving as busy crew members contributed to the illusion. In 1986 Roman Kroiter produced the first IMAX stereoscopic 3D film (in anaglyph mode), We Are Born of Stars, and in 1985, co-produced the first full-color OMNIMAX 3D film, Echoes of the Sun, 1990 (in active LCD shutter glass mode). 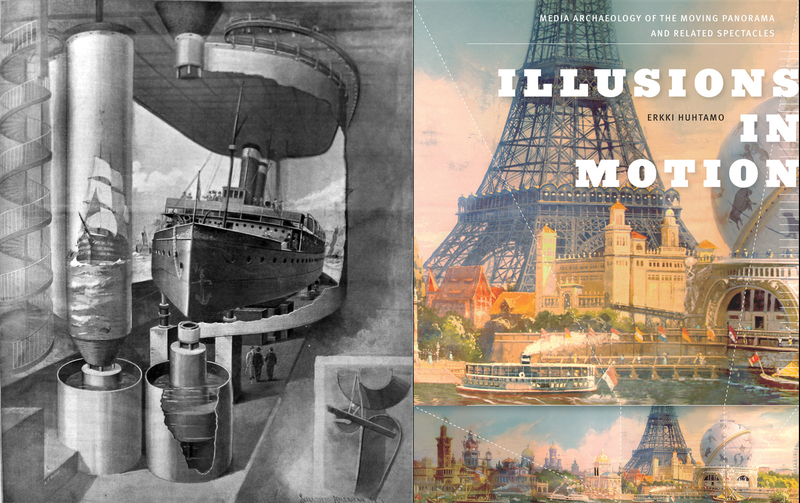 As of this writing, the IMAX Solido stereoscopic 3D film, Sea Monsters, is being shown on a 9,700 square foot hemispherical screen at Futuroscope, Poiters, France, using what is claimed to be the most powerful double projector system in the world. Gizmodo’s A Rare Tour of IMAX Cameras by Mark Wilson provides a look at the various versions and configurations of the IMAX acquisition technology. 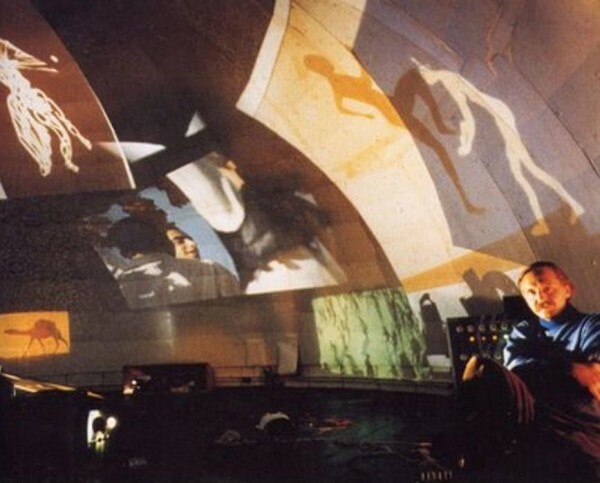 The history of projecting images on a domed screen can be traced to 1922 when Walther Baursfeld, an engineer for Carl Zeiss optical company, developed and patented the worlds first reinforced concrete dome to house the planetarium projector he had designed. The steel reinforcing grid for the dome is structured on the same sub-divided icosahedron principles independently realized by Buckminster Fuller in his geodesic dome work in 1949. 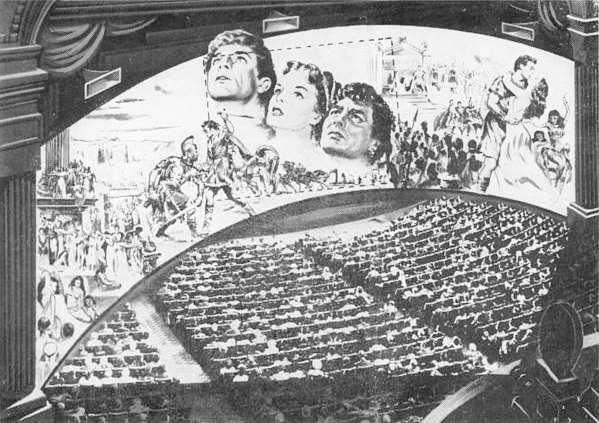 Fuller’s dome designs were subsequently developed as a screen surface support for numerous dome projection theaters and are often used in creating mobile full dome theaters today. 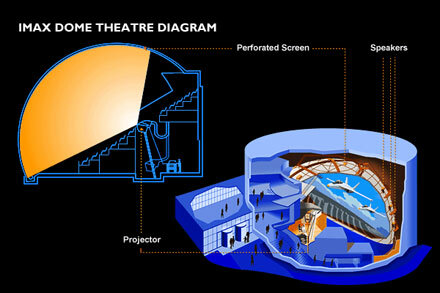 One such theater is the Vortex Dome located at Los Angeles Studios which is scheduled to be the site of STATE OF THE ARTS 2013: The Future of Fulldome on 12 December 2013. 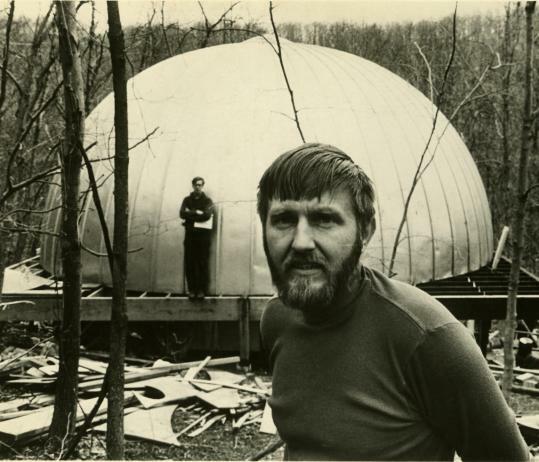 Between 1965 and 1967, at Stony Point, New York, Stan VanDerBeek constructed his 31-foot-high Movie-Drome, which he constructed from a mail-order grain silo cap mounted on a lofted wooden platform. He outfitted the inside of the dome with sound and projection equipment for audience members to take in while lying on the floor. He saw this as a prototype for a future network of domes to be erected around the world, with images transmitted among them via satellite as described in Culture Intercom: A Proposal and Manifesto which was published in the November 1966 edition of Film Culture (which influenced my sense what the social function of my work with the multimedia ensemble, Single Wing Turquoise Bird, could become). 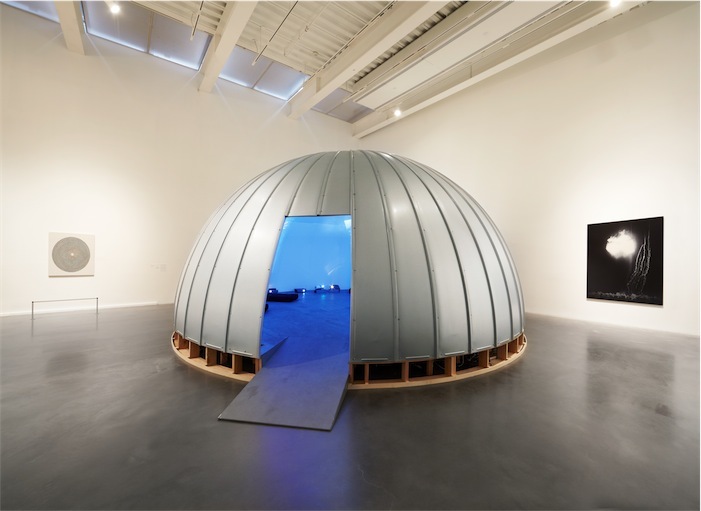 Exhibitions of VanDerBeek’s work and ideas at The MIT List Visual Arts Center and the Contemporary Arts Museum, Houston in 2011, and the New Museum in 2012 have shown the prophetic nature of his vision, particularly in light of the intercom of current social media enabled by the internet. A number of companies sell fulldome services or turnkey solutions into what appears to be an expanding market. 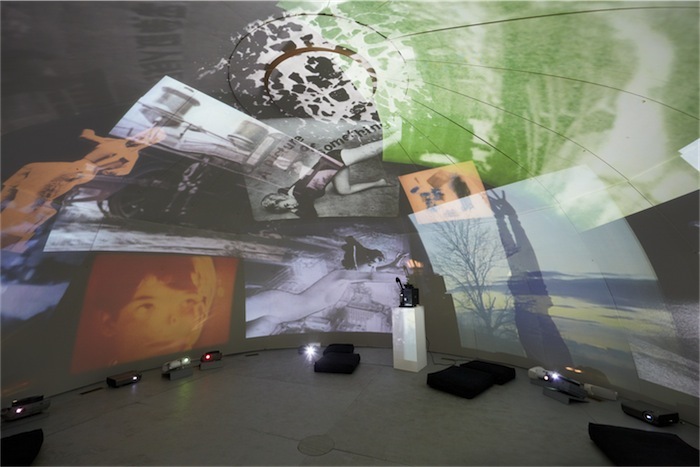 The DIY approach taken by artists like Stan VanDerBeek is flourishing with free tools and advice on how to create stereoscopic fulldome fisheye projection. 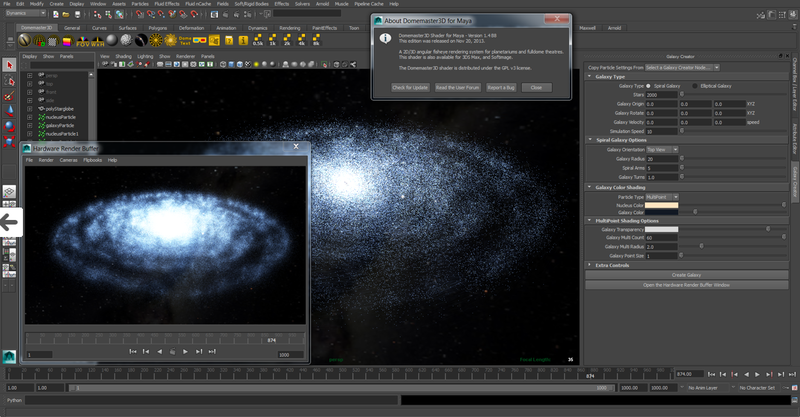 The Stereo Domemaster shader is a free open source solution for stereoscopic fulldome projection. The following five part posts written by Roberto Ziche, Aaron Bradbury, and Andrew Hazelden, provide a comprehensive look at the conceptual development and use of the shader. Reading all five parts will give you an invaluable understanding of the issues and solutions involved with that art of creating fulldome media. Two fixed cameras with a wide field view lose the 3D effects on the sides a the points of view align. Andrew Hazelden’ Domemaster3D Stereoscopic Shader for Autodesk Maya and 3DS Max is a powerful tool-set for creating stereoscopic fulldome projections. 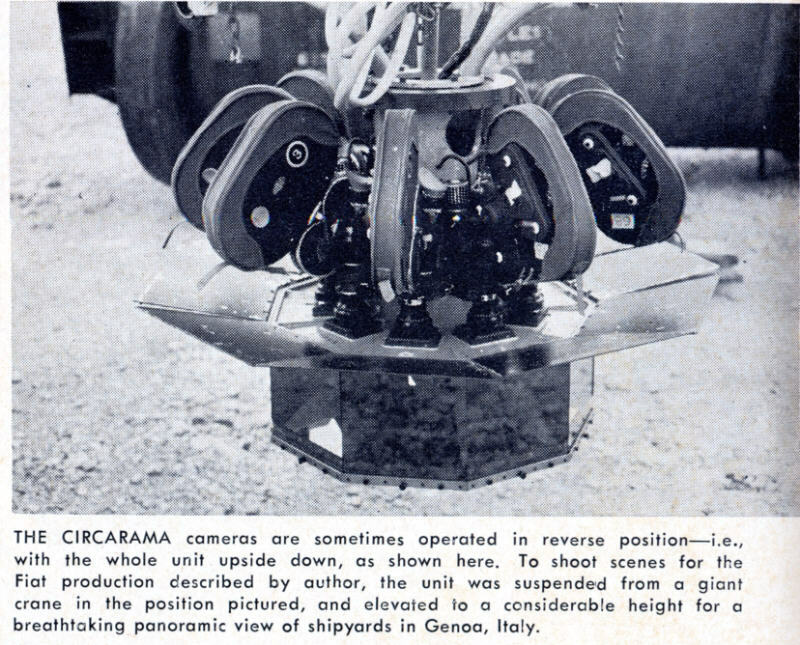 In what can be considered to be a continuation of the cylindrical panorama multi-camera / multi-projector work of Raoul Grimoin-Sanson’s Cinéorama of 1900 (ten 70mm movie cameras) and Walt Disney and Ub Iwerks‘ Circarama of 1955 (eleven 16mm movie cameras), cylindrical arrays of wide angle digital cameras such as the Jaunt ONE (sixteen custom light-field cameras, and the GoPro Odyssey (sixteen GoPro Hero 4 cameras) have emerged in 2015. The images from these cylindrical array’s of digital movie cameras may be projected with a similar array of digital projectors. However in the most predominant use, the individual camera images are warped and stitched together into a single digital movie file which is then virtually projected as a 360º image space to be viewed with head mounted or hand held display devices such as the Oculus Rift or Google Cardboard. Image stitching software allows for image retouching to blend seams and remove visible camera support hardware captured at the image nadir. A 360º x 180º image file may also be sliced into segments to be projected by multiple projectors (typically from 3 to 6) arrayed around the perimeter of a hemispheric dome. The images slices on each projector must be carefully registered and blended at the edges to achieve the immersive fulldome effect.